Homemade Trail Mix or Granola – Choose a simple, store-bought trail mix or bag up some yummy homemade granola cereal that you can just eat dry out of your hand. Whole-Grain Muffins – there are so many options for delicious muffin recipes! Washed, Peeled, and Sliced Veggies like Carrots, Cucumbers and/or Celery – pack them in a divided lunch container with hummus or homemade dip like ranch or tzatziki – yum! Also, don’t forget to bring plenty of water along as well. If you will be flying just keep your reusable water bottle empty until you pass through security and then fill up on the other side. 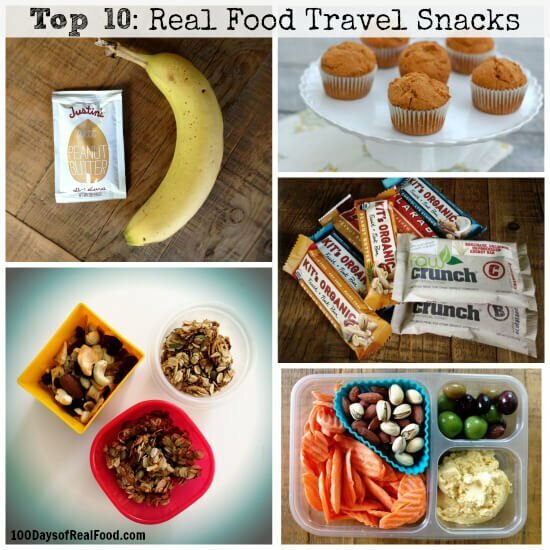 Please share your favorite “real food” travel snacks in the comments below! * You can take solid foods through security, but according to the TSA website, any creamy dips, spreads, or other liquids must be placed in containers 3.4 oz or smaller and placed in a quart clear sized plastic bag. This includes foods such as jelly, peanut butter, spreadable cheeses, sauces, salad dressing, etc. Previous Post: « Special Report: Eating Our Way Through Europe! Earlier this summer I took a bunch of friends up to my family’s cabin and did all the shopping for meals (so much cheaper and easier!). The biggest hit was a trail mix bar! I stocked up on dried fruits, nuts, candy, yogurt-covered pretzels, etc. from the bulk section of WinCo and brought a box of snack-sized Ziploc baggies. This way each person could put together a mix based on their own preferences and dietary needs (one gal has tons of food allergies, another is avoiding gluten). We were at the cabin for four days, so we all enjoyed inventing a new mix each day, too. It was such a winner, I can’t wait to do it again on future group outings! We have one of those insulated box coolers from One Step Ahead that my 7yo daughter can reach and help herself during the entire road trip. This is all the same stuff she eats at home, just packed in individual servings. Awesome! This is good for every day not just traveling. My mom always had emergency supplies in her car that included snacks. I’ve continued that tradition and when each of my children became drivers it gave me comfort that they were prepared. A small auto tool kit, a blanket, case of water, snacks, hand crank cell phone charger and a notepad are included. Small raw okra is a great snack too. Add a little sprinkle of sea salt. Don’t cut it before you eat; just wash and pat dry. Thank you, thank you, thank you! I have been eating clean for 7 weeks now, loosing weight and feeling great. We are going on vacation this summer and we’ll be rarely staying in once place more than one night. I am concerned about eating healthy and thinking about ways we can do this while on vacation. Thanks so much for these tips!! Wow, are you a mind reader? lol. We just got back from vacation and I was telling my husband “We have to come up with more snack ideas”. I was not completely prepared and was happy that I found bottled water, bananas, and unsalted trail mix at the gas station. I had also packed orange slices, blueberries, and carrots sticks, but I still was trying to rack my brain for snack ideas. Thanks for posting this. This post has come at the perfect time for me. We are gearing up for a big move – 10 to 11 hour relocation with a 5 yr old, a 3 yr old, and a 10 month old. 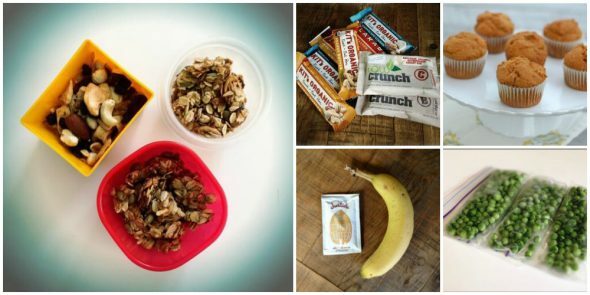 I will definitely be adding these snacks to our plan – great for the kids and the adults. Thanks for the suggestions! My husband and I just made a 3-day cross country move. We made sure to stock up on essentials and travel with a big cooler plus smaller insulated lunch boxes for healthy meals and snacks along the way. We had many of the foods you listed (I like to put almond butter and bananas on a brown rice cake for a tasty lunch or snack option). We also had blueberries, cherries, figs, homemade granola bars, hummus, carrots, cheese, muffins, and crackers. For lunch, my husband likes to eat pastured, nitrite-free salami and local cheese with whole wheat bread. I’m gluten free and vegetarian, so I stuck with hummus and rice crackers, olives, cheese, and fruit. We also were given a roasted red pepper spread from Trader Joe’s that was yummy on crackers with cheese. One thing I did was pack a water bottle filled with sweetened coffee and another water bottle filled with local, organic milk. When i needed a little pick-me-up during the drive, I’d make myself a homemade cold latte! It was great because I knew where the coffee and milk came from and it wasn’t sweetened with packets of white sugar along the road! We did splurge on some naturally fermented and fruit-juice sweetened ginger ales to help us stay awake on the long drive! We don’t drink soda, so these were a special treat. Long road trips are fun, but can be stressful without good snack and meal options. We always try to plan ahead and stop at stores in big cities along the way to restock, if necessary. I like to make a healthy nut bread then make it into sandwiches with cream cheese (on pumpkin bread, for example) or peanut butter (great on banana bread). I pack them in a large sealable container but they could also be individually packaged in resealable bags. GREAT ideas! My family spends a great deal of time in the late summer and into fall hunting here in Oregon. When we are lucky enough we get tags for Eastern Oregon and spend about 2-3 weeks over there camped out (we live on the Oregon Coast). Since switching to a clean eating gluten free lifestyle I have been losing weight (and inches and sizes) and feeling great but have already worried about our camping trips. In the past it was a lot of canned soups and hamburger helper type stuff as well as sandwiches ect. This trip in October will only be my hubby and I and 2 of our 3 dogs(our son is 21 now and needs to stay home for work)and I plan on making the whole trip clean eating/gluten free. All of these suggestions are GREAT! Anyone with anymore suggestions I would love to hear them!!! It’s a lot of work to travel and bring along all the food, but it’s so worth it to avoid all the junk you find at the convenient stops (gas stations and such). Great list! These are all great ideas but I feel I must say something about the idea of bringing nuts on a plane. My daughter is level 5 anaphylactic to nuts. Some airlines will declare a flight nut free while others will create a buffer zone around us. By bringing nuts, you may unintentionally contaminate an area that the airline kept free of nuts for a serious medical reason. Anaphylaxis is real. Greta has been taken by ambulance to hospial 3 times and she is not yet 3. Please reconsider suggesting nuts as a snack in airplanes. We Love love love Apple chips in our house! I use a mandolin to slice a whole apple really thin and then spread it out on a baking tray. About an hour later we Chippies!!! my 3 year old would eat his way through 2 or 3 apples if i let him! It takes a while to cook them, but is so worth it. I also like some roasted chickpeas for a a bit of crunch. Theyre hit and miss with my son, but my husband likes them too!!! Some great tips so thanks guys. My kids are very picky so I always take the same snacks on small trips/picnics. They comprise of raisins, bread sticks, carrots, apple, ham and fruit. A weird combination but they love them. It’s AWESOME! Kids get a chance to speak with the growers and learn where their food comes from. They LOVE it! And frankly, so do we! Thanks! We often find ourselves out and about during meal time, and even if we have lunch at home I like to keep snacks on hand in the car. This is a big help. We always have some homemade granola around. We just make up a pretty big batch and keep it in a few mason jars. We have an attachment for our vacuum sealer so it keeps really well. I was in Colorado last month and got to try some of Justin’s Nut Butters – Super tasty! So timely!! We’re going camping this weekend and I’m planning healthy meals and snacks right now. Homemade wholegrain blueberry muffins with cheese bites for breakfast, trailmix/lara bars for snacks, cream cheese/raw veggie sandwiches for lunch+ pesto pasta, crockpot baked beans, local grass fed hotdogs for dinner. We’re going to eat like kings! Love the frozen pea idea, my son loves them. Aside from the fact that it doesn’t fit the rules in terms of sugar(s), how would you count that as # of ingredients? is it 5–syrup, crisps, chocolate, honey, raisins? or is it 9 by including each ingredient in the chocolate? I see this fairly often, so I’m not quite sure how I want to count that. We are going to be on the road for about 6 hours next month and I am definitely going to be using a few of the items on this list so we can satisfy hunger without needing to resort to fast food, ick! For my trip back home in June, I packed my own lunch, complete with sandwiches and trail mix. The sandwiches were even made on homemade bread! I hate feeling sluggish with all the fast food available in airports, and it saved me a lot of money too. Sometimes a meal for one person can cost between $8-10. We try not to snack in-between meals but we do like to pack meals to eat in the car or at our destination. I love knowing my kids are getting a healthy lunch, plus it saves time and money by not stopping at a restaurant. I also love vacationing at places with kitchenettes so I can bring food from home and cook our families meals. By eating healthy food for our meals, I feel OK about treating the kids to GOOD local bakery or local ice cream during our trip. Plus, since our trips usually occur over the weekend, it count’s as our dessert for the weekend. Just don’t try to take fruit or veggies through customs without declaring it and even then you may have to toss it. I have tried to prepare Brown Rice Cakes, Grain Muffins at home. Rest of the vegetables are also free and healthy. I will take care of your suggestion and fill by tank with fresh water. These are very good suggestions. Another problem is theme parks. Sometimes you take a trip to a theme park and you are forced to wait in lines for food you are afraid to eat. Its better to pre plan theme parks also. Thanks for the list. Just ordered the Raw Crunch bars. The discount code 100DAYS didn’t work, although I am happy knowing what snacks I can stock up on. Good timing as we start to prep for back to school already, and many of those are perfect for school lunches too! I also travel a lot for work, and am always struggling with eating on the road- I’ll reference back to this for help. We brought a loaf of peanut butter and honey sandwiches, with fruit and granola bars to Disney every day for lunch for the week we were there. we also ate breakfast in our hotel (we had rented a small condo with a kitchen), so the only meal we had out was dinner. it helped cut down on cost and eating badly tremendously. I always pack easy to eat home made snacks for the plane, then if we have to buy a sandwich or something small it’s not a big deal. This might sound strange but I bring small pumpkin pancakes for my girls. They love them and they are less messy than muffins. I also make waffles and cut them into strips. Love the ideas! We are recent converts to whole/clean eating. One of our “go-to” snacks is avacado. It is easy to bring along, put on bread or mix into egg salad. Great tips! I’m flying by myself with a 2.5 year old and 15 month old next week and this is a good list, although not sure about bringing a dip/hummus in your own personal container because it could technically be considered a liquid or something by TSA. I DO however love Justin’s squeeze packs :) They are perfect for air travel! Their almond butter is so yummy! also thanks for the reminder of Luna & Kit’s Bars. We love roasted beans or split peas. I roast them with steak seasoning in the oven for about a half hour at 350. They’re non-perishable, super cheap, incredibly filling, and a great source of protein. They’re not so good to use to keep yourself awake while driving though because you’ll get too full! My Granddaughter loves the pizza lunchables, can you please tell me where I can purchase the small squeezable containers of pizza sauce? I can put together the rest of the grated cheese and whole wheat pita pockets. I just found your blog and really like the information you share. I’ve seen you post these amazing little packets for snacks and lunches.. like the tomato sauce, peanut butter and I was thinking a couple others.. where are you finding these little packets of magic? When we travel with our kiddos – 11,10,7,5 and 4. I like to pre portion out snacks. I usually do 1-2 fruits, a veggie, a cracker or pretzel, either a sandwich of some kind or a meat rollup with cream cheese and a little treat with their water bottles. Then I place everything in their lunch box. When it gone its gone. Other things we might include if its a long drive, jerky, trail mix, raisins and then in the cooler I will do string cheese, yogurt. String cheese and hard boiled eggs are another one we usually bring along. We have a smaller cooler we keep in the car on road trips. We went through Happy Baby baby squeeze pouches like crazy when we flew with our 13 mo old. Just thought of an idea- we have reusable food pouches (Little Green Pouch brand), and we could do yogurt or smoothies in them. We use them for that at home, but on a road trip would be perfect too, and would last longer if were frozen beforehand. I love that you have frozen peas here. My son is 4 and has been eating “cold carrots” since he was teething. Frozen sliced carrots are a great travel snack and teething soother. My daughter has a severe tree nut allergy. 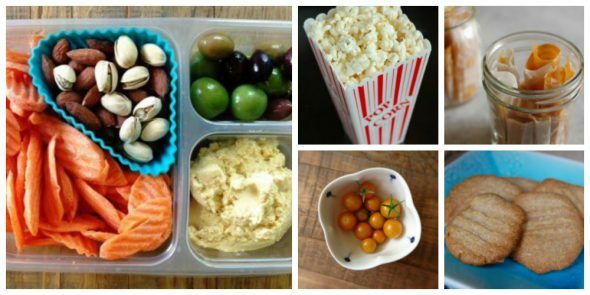 We pack snacks every time we leave the house, and I’m always looking for tasty whole snack ideas. You have a lot of great ideas here! Thank you ! Although I think the snacks containing nuts and nut butters are great for traveling in your own vehicle (she can eat peanut butter), I think it’s a little scary to fathom that my child might be exposed to tree-nuts from fellow passengers while on a plane where she can’t get life saving treatment. Epi pens are only the first step in saving someone’s life with a severe allergy. It is really just buying some time til they can receive further emergency treatment at a hospital. Because of this, no exposure is the goal especially while traveling by plane. I have a child with peanut and tree nut allergies. I totally agree that it is best not to bring nut products on airplanes because of the absence of medical care. You said this so much better than I did in my comment. Thanks! I am always on alert when I read about snacks containing nuts or recipes where the nut component is hidden. I know that it is more mainstream to feed children healthy nut snacks. My kids had snacks containing nuts before my daughter had her major reaction, so I get it. I just wish that the author of this blog would acknowledge the potential danger she is suggesting in her article. Airplanes and peanut/tree-nut snacks do not mix. I carry Benadryl and two epi pens daily for my child. These emergency medicines will not solely save my child from death, that is a misconception. Good luck to you! If we keep expressing the reality of our situation, eventually it will become more widely accepted and understood. This year I an bringing homemade beef jerky on our overseas summer trip as well as live kale crisps I’ve made with the dehydrator and a special tahini/almond butter dressing. We love air popped popcorn for trips in my family. It is relatively healthy and feels like such a treat too! That is an important tip about not bringing jars of peanut butter, jelly, etc. when you fly. My son is allergic to peanuts and tree nuts, so we wanted to bring a jar of sunflower seed butter with us on vacation to disney world. The girl at security called out “code (some color)” and she confiscated our jar of sunbutter. I was so confused. I tried to explain that we were bringing it with us because of my son’s allergies, but it was very stressful. We almost missed our connecting flight and made to feel like we were terrorists. Apparently, you are not allowed to fly with semiliquids becaue they are considered a terrorism threat. Freeze dried fruit. We buy in bulk and then mix bags together of fruit and veg like peas, mango, blueberries, pineapple. Much lower sugar content than air dried fruit and the kids love the light crisp texture. I usually pack my Protein powder & my shaker cup. Then I can use ice water in a crunch and still have a good snack or meal. Chia seeds to add to yogurts. I usually scope out Trader Joes or Whole foods that will be close and buy yogurts, almond milk or coconut water. I understand the concern with nuts on airline (my son has a nut allery) but it is unreasonable to tell people not to bring nuts. People need to take their own precautions. Wipe the armrest and have snacks for yourself or kids that are but free. Personal responsibility will teach your children so much more than expecting others to abide by a nut free policy. I agree, Sandi! I fully understand the terror of exposing your child to an allergy, but the world has allergens everywhere. You cannot ban all allergens from every potential contamination place. It is unreasonable to ask someone to not being peanut butter, etc. on a plane. Bring your meds, change seats if you need to. I am a vegan and really struggle to get what I need at an airport, especially good forms of protein that are portable. Packets of peanut butter are a life safer and I bring them whenever I travel. We are about to do a road trip from Tennessee to Colorado so I have tortilla wrap sandwiches, cheese, whole grain crackers (I love Mary’s Gone Crackers), carrots and hummus, dried organic mango slices, and homemade granola bars on the in-car menu, plus lots of water (and probably a couple stops for black coffee along the way). Trying to make it as healthy as possible. -Vega One All-in-One Nutritional Shake along with a blender ball shaker cup. Good for an emergency meal if your stuck. -Kind snack bars: pretty common now. Can usually find at most airports. I have noticed a trend that airports are getting better and better food. For example, the Rick Bayless restaurant Tortas Frontera in O’Hare lists out on a board the local sources/farms and their farming practices. While not perfect, on a scale of quality it is much better than other typical airport garbage food. On last tip. I keep the Yelp app on my phone and I use Yelp and Apple Maps to do searches in my arrival city for the following phrases: “organic restaurant”, “farm to table”, “juice bar”. Very often you can find hidden restaurant gems in a lot of cities that serve local and organic food. I am super confused by the Justin’s nut butters, they have palm oil in them and I thought palm oil was bad for you? Hi Beth. We do buy Justin’s sometimes but as a more general rule, nut butters do not need added oils. Great suggestions and these are all things kids like. Thanks for sharing this! I am confused by the recommendation o carry nuts onto a plane The scariest thing in the world. Is to have a nut allergy, be confined in such a small spe and worry that th person next to you will eat nuts. Please be careful abou t nut on planes. We go hiking, often. I was able to find a dehydrator really cheap while in Switzerland. Pretty sure they are even cheaper in the States. I make dried fruit and beef jerky all the time. The dogs love the beef jerky too. Plus for everyone.